Depending upon the four year college or university that you decide to attend, you will likely need to pursue your career plans through a Bachelor of Science with a focus in Health Services Administration. As you work to complete your bachelors degree program you will be required to complete courses that teach you about accounting, long term care management, legal health care issues, health care management and finance, marketing, health care data management, and quality assurance. Many colleges and universities require their students to complete an internship or a research project just prior to graduation. This allows students the opportunity to apply what they have learned in a real world setting under some supervision. For individuals who have been working in a medically related field, a more advanced course of study may be more appealing. While the specifics of an advanced program of study vary from one college to another, it is typical for this type of program to require that an internship, a thesis, or a research project must be completed. Upon successful completion of your bachelors degree, you may want to seek certifications that will be helpful in your day to day work. For instance, you could choose to be certified as a Registered Health Information Technician or as a Certified Medical Assistant. Regardless of which certification you may choose, this will demonstrate your abilities and your goals to your potential employers. Keep in mind, certifications will need to be kept current by completing continuing education hours. With your health information administration degree you will be well prepared to enter the work force in a variety of employment options. For instance, you could seek employment as a medical transcription specialist, a health information specialist, a health information technician, a medical office coordinator, medical language specialist, a clinical data specialist, a chief privacy officer, a HIM department director, an information security manager, or as a health information system manager. Keep in mind, this list of employment options is not exclusive; therefore individuals with a bachelors degree have many more options that they can choose to pursue. Should you decide to become employed as a manager at a nursing care facility you will probably be responsible for handling the financial aspects of the facility, hiring and evaluating employees, managing care delivery, making sure that all employees are following the policies of the facility, and supervising the scheduling of employee's shifts. If you seek employment as a health information manager you will likely spend your days supervising the storage, management, use, and coding of medical information in a health care facility. 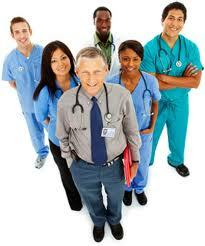 - Have the experience required to be eligible for health service positions in management. - Be able to collect and act on data received and the ability to use that data to help make informed decisions. - Understand financial management and strategic planning within your decision making process. - Be able to deal with ethical issues as well as legal issues and how they related to the health service industry. - Be able to work with and evaluate issues regarding health services within a family or group setting. - Understand all of the challenges associated with the industry including multi-cultural and interventions. - Master the ability to conduct sound research. Hands On – A good health service manager is very hands-on and doesn’t manage from an office. Great Communications – As expected a good manager needs the ability to be a good communicator, especially when dealing with such a large staff. You need to be able to communicate your goals to the team and provide the necessary feedback to accomplish those goals in a healthcare setting. Dependable – All managers should have the ability to be dependable. The staff they are responsible for looks to them for the proper direction. You need to be sound in your judgment and be a leader others will want to follow. Vision – Every good manager has a vision for the place he or she is working at. Not only is vision necessary as a leader but it is very important to the employees that you manager so they have a clear understand of what is expected of them. Because you have a lot of choice regarding which school to attend for your Bachelor’s Degree in Health Services it is recommended that you spend a little time with each one and write down what is important to you for the school to have. Here are some of top things students look for when researching schools. Nobody likes it when they buy something only to find out later on more fees are needed. When looking at schools find out what fees they add to their tuition costs. Some schools charge application fees, technology fees, email fees and even for your cap and gown when you graduate. A big one that most don’t realize is credit transfer fees. This is our option is the worst fee as it doesn’t take any time nor does it cost the school money to accept credits from another school. A very important area for any school is their career services or support departments. If the school is good they will have a really good department that will help you find a job in your field of study after you graduate. Most schools these days have their degrees or certificates available online. Even if you are taking the program from a campus based school it is good to have the option of changing to online if needed. If you have a problem going to school at the same time each week or the distance to your campus is too far then online might be the way to go. It actually always amazes me when I hear of someone that simply enrolls in a school for a Bachelor’s degree in health services management only to graduate owing $80,000. On average you shouldn’t spend more than $30,000 for this or any other Bachelors degree. Some of the top state schools have tuition of $10,000-$15,000 per year so you should never pay more than what your state university is charging.